This change to the RSS air temperature TMT product represents a major upgrade. There are 4 important changes to the methods used to construct the dataset. 1. The method used to make adjustments for drifting satellite measurement time was changed. In the new method, the model based diurnal cycle climatology used for these adjustments was optimized so that it more accurately removes intersatellite differences due to drifting local measurement times. This is the most important change, and leads to substantially more warming during the 1999-2005 period when the NOAA-15 satellite was drifting rapidly. 2. Intersatellite offsets are now calculated separately for land and ocean scenes. This prevents errors in the much larger land measurement time adjustments from adversely affecting ocean measurements, where the adjustments for measurement time are much smaller. 3. More fields of view are now included in the dataset. This serves to reduce spatial noise due to gaps between the satellite swaths. 4. Two new satellites, NOAA-19 and METOP-B have been added to the dataset. Since the paper describing this V4.0 upgrade appeared online, we have received a number of questions concerning its contents. Below is an attempt to answer some of these questions, and to provide some details about the upgrade for users that do not have access to the early online release. (The paper will be open access once it is officially published by the Journal of Climate). How does the new version compare to Version 3.3? Version 4.0 TMT shows more warming than V3.3, particularly after 1998. 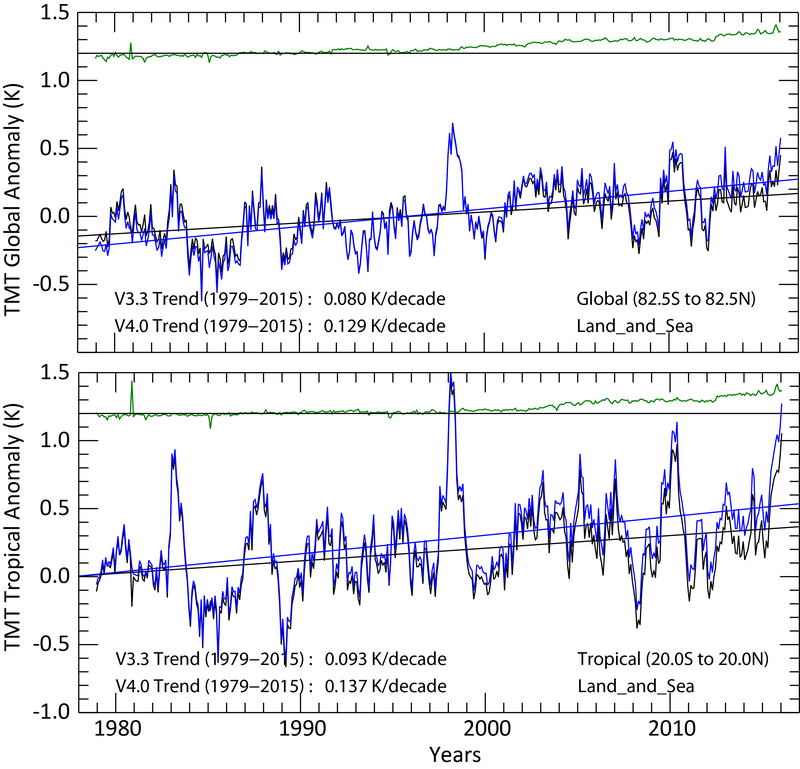 The plot below shows a comparison of V3.3 (black) and V4.0 (blue) time series for near global (82.5S to 82.5N) and tropical (20S to 20N) averages. How does RSS V4.0 compare to MSU/AMSU datasets constructed by other groups? Our new version shows more warming than the results from other groups. The plots below show a comparison for near global (82.5S to 82.5N) averages. The new V4.0 TMT dataset agrees the best with the NOAA STAR dataset (Zou and Wang, 2011), but shows more warming during the most recent decade than STAR. This is not surprising, since the STAR data use a diurnal adjustment closely related to the adjustment we used in V3.3. Other differences with STAR are caused by different approaches to calibration, and a different mix of satellites used in the most recent decade. In the above figure, the differences for each satellite pair have been offset to make it easy to see the lines for different satellite pairs. In the tropics, we can also compare our results to the dataset produced by the University of Washington, which is only available in the Tropics. Our new results agree well with the UW results, which is not surprising as they use a very similar approach to adjusting for diurnal drift. Our diurnal adjustment was inspired by the UW work (Po-Chedley et al., 2015). What motivated the V4.0 TMT update? The update was primarily motivated by the large relative trends between different AMSU satellites in our previous version. These differences were large enough to cause problems in the final dataset. For the AMSU satellites, the most important adjustment we perform is the adjustment for drifts in local measurement time. Over the mission of most satellites, this time drifts by several hours, and the time of day measured by the satellite might change, for example, from 2:00PM and 2:00AM to 8:00PM and 8:00AM – a 6 hour change. See the plot of MSU and AMSU measurement times. If uncorrected, this measurement time difference can obviously lead to large temperature differences between the satellites. Below is a set if plots of global mean measurements before any adjustment. The plots are for Ocean values only. The left plot shows monthly means, the center plot shows annual means, and the right plot shows intersatellite difference trends for each satellite pair. Over land, the diurnal cycle is much larger, leading to large differences between the various satellites. The differences are largest for satellite pairs that involve a drifting satellite, like NOAA-15 or NOAA-18. This adds confidence to the idea that these differences are mostly due to the diurnal cycle. The intersatellite trends are much smaller. Note that the trend involving NOAA-15 minus AQUA has changed sign, suggesting that the effects of changing measurement time from 7:30 to 4:30 were overcorrected by the model. Clearly something needed to be done. We were inspired by the work of the University of Washington group, who constructed a diurnal adjustment entirely from the satellite observations themselves. This approach has limitations, as the data would be too noisy to accurately retrieve the diurnal adjustment for each location on Earth. The diurnal cycle is quite different for different locations. The diurnal cycle over desert regions can be several times the size of the diurnal cycle of a forested region at the same latitude. So we choose to retain the model diurnal cycle as a starting point, and made small adjustments to the model-derived diurnal cycle so that the intersatellite differences were further reduced. We did this by adding a small second-harmonic adjustment to optimize the diurnal cycle at each latitude. The parameters of this adjustment were determined by mathematical regression. Separate adjustments were made for land and for ocean. This plot shows the global mean diurnal cycle before (thin line) and after (thick line) the optimization. The left plots show the global mean diurnal cycle, and the right plots show the diurnal cycle when the ascending and descending orbits are combined. Ascending and descending measurements are made approximately 12 hours apart, so the effects of the adjustment appear larger. Here are the intersatellite differences after the optimized diurnal adjustments are applied. After this adjustment, the differences look good except for differences involving NOAA-15 late in its mission. We suspect there is a calibration drift in this satellite, which is support by the similarity of the problem in both land and ocean measurements, so we have eliminated the use of NOAA-15 after 2011. There are lots of other satellites operating in that time period that appear to be more reliable. In summary, we made a change to the dataset to reduce the intersatellite differences, particularly for the AMSU data. We applied the same method to all the data, including MSU and AMSU. We suspected that this would lead to more warming during the part of the NOAA-15 mission that underwent a large drift in measurement time, but did not know the result for the entire dataset. What about the NOAA-14 NOAA-15 overlap? Since our paper was published online, we have been accused of mishandling the overlap between NOAA-14 and NOAA-15 and/or the adjustments for NOAA-14. First, we note that our treatment of NOAA-14, except for the diurnal adjustment, is unchanged from V3.3, so we do not understand how it can be the cause of two thirds the change. In fact, we used exactly the same code as we used for all the work presented in the paper, but with the un-optimized diurnal cycle, without the addition of NOAA-19 and METOP-B, and without the changes to which AQUA and NOAA-15 data were used to generate Fig. 8a in the paper, reproduced below. Clearly, the change in the diurnal cycle is the main cause of any differences between V3.3 and V4.0. We agree that there is a problem with either NOAA-14 or NOAA-15, or both. We explicitly discuss the problem with the NOAA-14/NOAA-15 overlap in the paper. We do not know if the problem is due to NOAA-14 or NOAA-15. If we assume that all the drift is due to NOAA-14, as Dr. Spencer would like us to do, we can eliminate the use of NOAA-14 after 1999 so that its (potentially erroneous) trend during the overlap period does not affect the overall results. If we do this, the overall trend is decreased by 0.019K/decade. 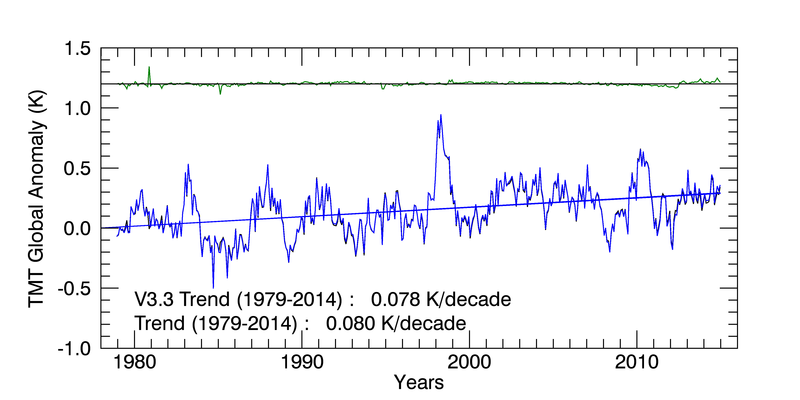 Using the current trends through February 2016, this would lead to a decrease from 0.133 to 0.114 K/decade. This adjusted number is still well above the trend in our previous versions, and also above the trends in UAH V6, UAH V5.6, or NOAA STAR V3.0. 3. we assume that the error is shared between them, and we keep all the data. *we keep about a year of data during the MSU/AMSU overlap period as any shorter time period would lead to excess noise in the MSU-AMSU difference we use to adjust AMSU to match MSU. These results are reported in the paper, and the differences between them should be viewed as part of the uncertainty in the final results. For the final dataset, we used case 3 where the errors are shared between NOAA-14 and NOAA-15, which is reasonable because we do not know the source of the problem. See Section 4F of the paper for a more formal discussion of the problem. As far as this problem in V3.3, it was discussed in our formal error analysis of that dataset. See section 2.6 Mears et al, 2011. It accounts for roughly half of the variance in long term trends in V3.3. The MSU/AMSU relative drift problem is likely the largest remaining issue in the dataset. We have not in any way swept this problem under the rug. NOAA STAR Data: Zou, C.-Z., and W. Wang (2011), Intersatellite calibration of AMSU-A observations for weather and climate applications, J. Geophys. Res., 116, D23113, http://dx/doi.org/10.1029/2011JD016205. University of Alabama, Huntsville Data: No relevant paper has been published.